I spent 5 months teaching and practicing yoga in Nicaragua in 2016. 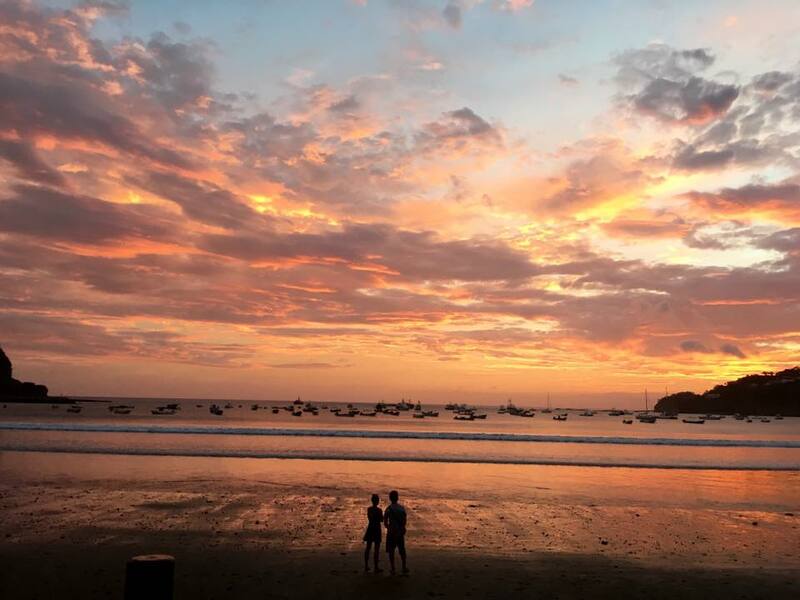 I landed in San Juan del Sur initially, which is situated along the Southern Pacific coast of Nicaragua. The first place I took a yoga class at in Nicaragua was Zen Yoga. It certainly was a slice of zen in this bustling little town. Surprisingly, there is quite a bit of yoga in San Juan, which helps to balance out the party vibe of the town. San Juan is home to many bars, a variety of restaurants from local food to Thai and pizza, and of course, the infamous Sunday Funday. It is also a hub for surfers, so yoga in this area provides a sweet relief from the waves, too. Zen Yoga is tucked away toward the end of town, near the Central Parque. They offer classes 7 days per week during the morning and evening. Upon entering the space there is a small garden and an open-air lobby area to check in, sit on the couch, or browse their apparel. There is also a delicious juice bar with breakfast food attached downstairs that is perfect for after class. The actual studio is located upstairs, above the lobby. It is an open-air wooden platform overlooking the town. They have a full selection of mats and props, including bolsters, which is nice to see in Central America. I took 3 classes from Sally, who seemed to be on the schedule a lot. I would have liked a little more variety but it didn’t fit my schedule. However, as a yoga teacher myself, I also know what a blessing it is to work full-time for a studio. Her classes were a nice flow and I appreciated her hands-on adjustments. However, sometimes the space was not particularly zen due to being in the town. There were often sounds of construction and street noises. On one particular morning, there had been a big celebration going on in town the night before and multiple cannons were still being fired and Latin music was being blasted at 9 am, in the middle of class. The cannons, of course, were a shock to the system but as with anything- just live and let go. Just return to the present moment. It was a good lesson in this. It’s all a part of the cultural experience, right?! I was contracted to teach a private lesson through Zen Yoga for a woman from Managua. 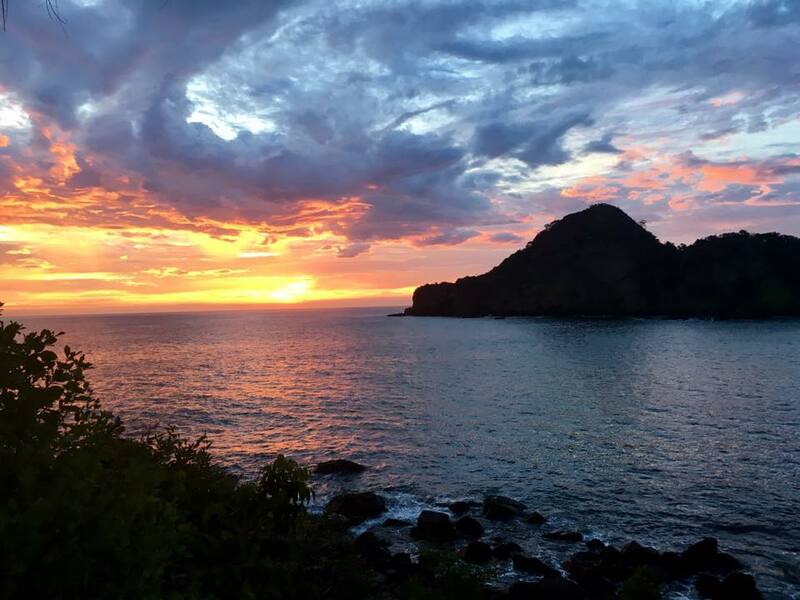 Her family owned an amazing compound overlooking the San Juan del Sur bay. I feel very blessed to have taught her in this beautiful space. They even ended up hiring me to teach their daughter hula hooping and gymnastics afterward! I had been in talks to get on the schedule teaching Pilates weekly at the studio, but I decided to leave San Juan sooner than anticipated. Casa Oro is a hostel located not far away from Zen. They offer donation-based yoga as well in their rooftop bar. It recently underwent an artistic “regeneration” to include several new floor paintings, a wall mural, and a glass bottle chandelier. During my short stay in San Juan, I taught several classes here and had the opportunity to take one from one of my fellow collaborators, Jaime, who was from Mexico. It was certainly a unique space to teach and practice in, and the wind and rain could make it particularly intense because of the noise. The crowd here was also much more relaxed and easy going, as it mostly consists of backpackers from the hostel. It was truly an interesting and transformative spot to practice yoga, meet people, hang out during the day, and have a few drinks at night- quite the all-around spot! It was a great option for those traveling on a budget. I think they have since moved the yoga classes to a dedicated space outside of the bar. I also had the opportunity to teach one class at Muuv Dance & Yoga, which is a newer studio built on an elevated platform with a thatched roof similar to Zen. But what makes Muuv so unique is that they have full-length mirrors! As a dancer myself, I appreciate this- and they offer kids dance classes- which is such a special offering for this part of the world. It is located in between some bars and the rain can make the floor quite wet, but if you are looking for an intimate yoga spot- this is it. My next stop along my yoga journey was the surf town Popoyo. There are a few places to do yoga here. Gabriela owns Prana Shakti, which is a cute elevated shack right on the beach. Her class was an amazing blend of Kundalini-hatha-flow. Her classes were also donation based, and she is an absolute sweetheart. I loved how she incorporated chanting into her class, even in the middle of a flow. Her class schedule is usually posted through her Facebook page, which is important to check if she needs to cancel for any reason. There is also Magnific Rock nearby which has a well-known yoga and circus arts program in the region. I did not have the chance to practice there (although I did get to perform once! ), but they have regular classes overlooking an amazing surf break. After this journey, I settled into teaching at one of Nicaragua’s premier destinations, Aqua Wellness Resort. Aqua has the most spectacular yoga deck in the country and is home to its pristine private beach, Redonda Bay. Just thinking about it makes me miss the sheer beauty of this place! Their large yoga deck is elevated and overlooks the ocean. You can hear the sound of the waves and the geckos chirping. You feel very close to nature here- no music is necessary for these classes- the sounds of Mother Nature are enough. This was one of the highlights of my time in Nicaragua and a highlight of my career teaching in such a beautiful place. It really is a place like no other in the world. I taught a Vinyasa in the morning, a slow flow or yin in the evening, and offered some meditation classes as well. We even started a Vino + Vinyasa on Friday evenings, which was a wine tasting following the class. It was a nice way to get to know some of the guests. Sometimes it was a challenge as I was the only teacher, however, it was the slow season when I was there, so my plate was never too full. They offer amazing treehouse accommodations and have an on-site restaurant. The closest town is Playa Gigante which is a 20-minute walk through the jungle. Surfing is not too far either! I also had the pleasure of teaching at Casa Lucia in Granada for a few days in exchange for accommodation as an “interview” before deciding to come back to Nicaragua and teach there for 2 more months after my contract at Aqua ended. Casa Lucia is a cute bed and breakfast providing a slice of peace in Granada, which is a bustling colonial little town. There is a nice garden pathway, a swimming pool, the breakfast is fresh and varied, and Eloisa, the owner, takes very good care of her guests. While in Managua, I had the pleasure of randomly make a new friend at the US Embassy who turned out to be a yoga teacher! That night, she invited me to take her Dawn Yoga class, which is based in Buddhism and completely different than anything I had done before. I finished 2016 teaching at Casa Lucia in Granada, and during my time there I took yoga and acro-yoga classes at Pure Gym. The gym is owned by 2 yoga teachers and has a great yoga program with experienced instructors and guest workshops coming through regularly. During my stay in Granada, I heard whispers of yoga at some other locations around town but never made it anywhere else. 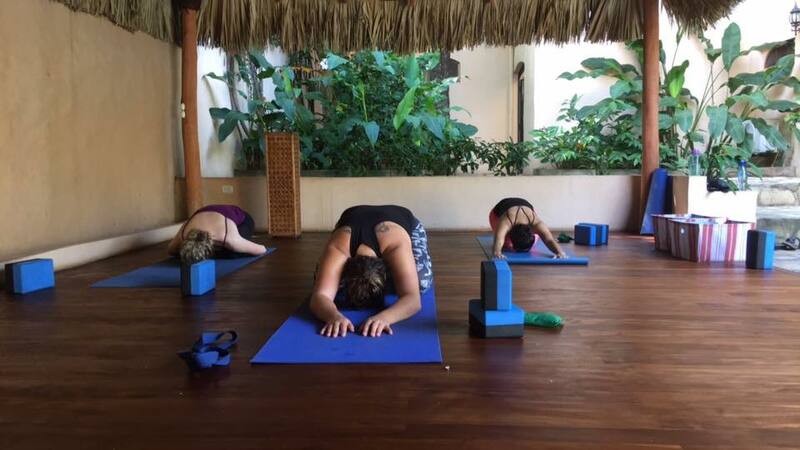 I discovered great yoga happening in Nicaragua when I arrived there last year, and it only continues to grow as a travel, yoga, and retreat destination. I think it served as a great launching point for my lifestyle as a traveling yoga instructor. The pay, however, as a yoga teacher in this country is lower than others such as Costa Rica or anywhere in Asia, so this is why I think it is better to start off here when you may not need as much money in the beginning (unless you are hosting retreats, of course, which is an entirely different ball game). 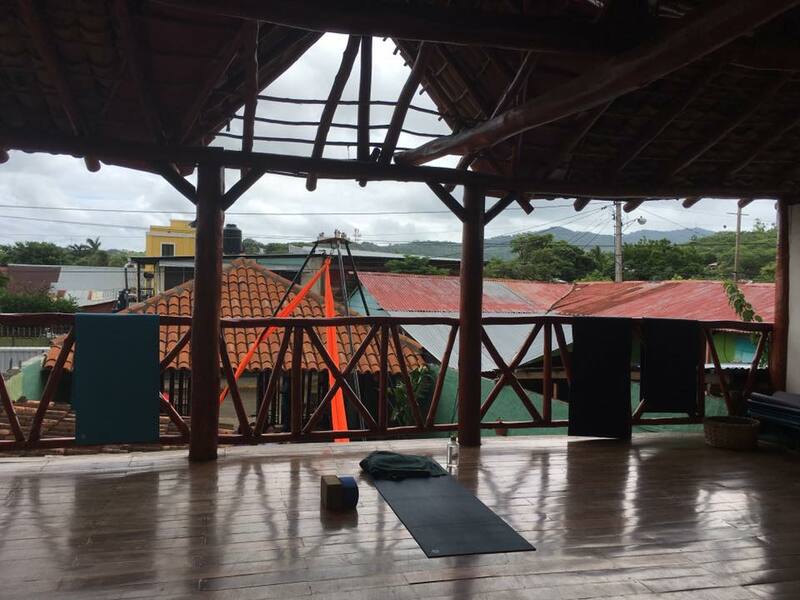 There is more yoga that I never even had the opportunity to explore in Nicaragua (such as in Leon) and yoga/surf camps are popping up all over the place! Nicaragua holds a special place in my heart, as it is where the seeds of my globally nomadic lifestyle I have been living for over a year now were planted. I can’t wait to return one day! It seems that right now Nicaragua is ripe for the picking when it comes to the land of yoga opportunity, as I only got to experience a small slice of it during my 5 months there. Have you been to Nicaragua? Let me know your favorite yoga spot! You paint a wonderful picture of all the amazing places u experienced. Wonderful tips and tricks of the trade. Anyone looking into traveling and teaching should read your blog! At El Zopilote Organic Farm, in Ometepe Island, guests have 2 free classes a day with great teachers!